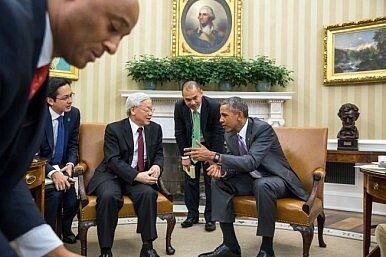 U.S. President Barack Obama meeting with General Secretary of the Vietnamese Communist Party Nguyen Phu Trong earlier this year. Upcoming visits next month by US and Chinese leaders will test Hanoi’s balancing skills. Once again, Vietnam’s diplomatic balancing skills will be put to the test this November when Vietnamese leaders are expected to host Chinese President Xi Jinping and U.S. President Barack Obama within days of each other. This will be Obama’s very first trip to Vietnam, while Xi’s trip will also be the first of any Chinese president since 2005. Since Vietnam has been committed to maintaining cordial relations with both powers even against the backdrop of the increasingly tense situation surrounding territorial disputes in the South China Sea (SCS), this November will prove to be a delicate and defining moment for Vietnamese great-power management. U.S-Vietnam ties have been warming considerably in the past several years, with multiple high-level visits of leaders from both countries culminating in General Secretary Nguyen Phu Trong’s unprecedented visit to the United States this July. The result was the historic U.S-Vietnam Joint Vision Statement, which provides a crucial framework within which U.S-Vietnam relations could continue to develop in the longer term. Within this context, Obama’s trip to Hanoi would only consolidate and deepen these ties further. However, obviously this time Obama will not be in Hanoi to push for the Trans-Pacific Partnership (TPP) since the negotiating parties had already reached an agreement and the Vietnamese National Assembly would almost definitely ratify the TPP agreement. At a moment when China is rapidly building up artificial islands in the SCS while the U.S. has announced plans for maritime patrols within the territorial waters of these islands, it seems certain that China and the SCS territorial disputes will feature prominently the talks in Hanoi. From Hanoi’s perspective, “leaning to one side” risks eliminating diplomatic flexibility. Besides, in any case, an alliance is probably not an ironclad guarantee of security vis-à-vis China, as Vietnam’s previous alliance with the Soviet Union had shown. Nevertheless, it is reasonable to expect that Obama’s trip would still boost defense ties between two countries considerably, perhaps even leading to a further lifting of the ban on lethal weapons on Vietnam that has already been eased. Moreover, Obama could use the occasion to garner diplomatic support for his more assertive patrolling scheme while moving Vietnam further away from China’s orbit. If at least some of these outcomes do materialize, the trip would at least bolster U.S position in Asia while giving Hanoi a stronger hand to drive a harder bargain vis-à-vis Beijing. Unlike Obama’s much expected trip to Vietnam, Xi’s trip comes at a troubling time in Vietnam-China relations. Relations have soured somewhat in recent years as China became much more aggressive in asserting its control over the islands in the SCS. In the past few years, Xi has probably done more to revise the status quo in the SCS than his predecessors in two decades. Most notoriously, in May 2014, China deployed the HYSY-981 oil rig within Vietnam’s exclusive economic zone (EEZ) in the face of vigorous protest from both the Vietnamese government and the Vietnamese people. While China unilaterally withdrew the oil rig after two months, the diplomatic crisis did much to undermine strategic trust between two governments and provoked a serious internal debate within elite circles in Hanoi. Since then, China has only accelerated its land reclamation efforts, with airstrips being spotted on some islands that could be used to eventually declare and/or enforce an Air Defense Identification Zone (ADIZ) over the entire SCS sometime in the near future. These moves have convinced Vietnam that China is not sincerely committed to agreements it has already signed such as the Declaration on the Conduct of Parties in the South China Sea (DOC). Given all this, it seems that Xi will be travelling to Hanoi with a near-impossible mission: to somehow put its smaller neighbor back in line and “reset” relations with Vietnam. Chinese leaders know full well that Vietnam will not simply turn into Japan or the Philippines overnight. But over the long term, given what is unfolding in the SCS, no one can predict how close Vietnam would align with the U.S camp. And it is difficult to see how any Chinese president at this point can seriously convince Hanoi that China is merely protecting its legitimate interests in the SCS and that Hanoi should play along with Beijing. Thus no one should expect any “U-turn” in Vietnamese policy toward China after Xi’s trip. Nevertheless, in the short term, Xi’s trip could still repair China-Vietnam ties to some extent and perhaps divert Vietnamese attention away from the current territorial dispute to focus on opportunities for cooperation between the two countries. In that vein, it would not come as a surprise if Beijing provides some economic deals and favorable loans to Hanoi during Xi’s trip. After all, such economic incentives are always welcomed and would encourage Vietnam to at least refrain from moving closer toward the United States in the short term and continue its current “tightrope walking” strategy. So far, Vietnam has been committed to walking a diplomatic tightrope between the two superpowers, delicately balancing one against another to reap the benefits while avoiding being trapped into a diplomatic cul-de-sac. If all goes well this November, “tightrope walking” will most likely consolidate as Vietnam’s preferred grand strategy for the foreseeable future, which would leave room for more creative policy options. In the longer term, this strategy could lay the foundation for a regional order around multilateral institutions and great powers bargains, which may offer a more promising future for small and medium powers in the region. Ngo Di Lan is a PhD candidate in Politics at Brandeis University, where he focuses on U.S foreign policy and U.S-China relations. He is also a research associate at the Center for International Studies (SCIS) at the University of Social Sciences and Humanities in Ho Chi Minh City. Calls for Hanoi to shift its approach are unrealistic and problematic.